You will fight against 59 players in the magical land for the victory. And there can only be one winner. Beat the dark dragon, open the supply chest, hunt the mysterious chests, trade with the goblins, strike down the enemies, survive, and be the last one standing. Survival Heroes game lets you enjoy the fully action-packed intense MOBA gameplay with the battle royale mechanics on your mobile. And today, In this post, we have covered everything about the game you need to know as a rookie; Survival Heroes guide and Survival Heroes tips, cheats & strategy to master the game. Before we dive into the cheats, tips & strategy guide part, let’s learn the basics first. In Survival Heroes game, you fight against other players around the world on a magical land with a wide range of weapons. There are a number of things you need to know: – Some weapons are locked in the Survival Heroes game. And you will not be able to pick or equip these weapons in the battle. You can unlock these weapons by spending gold or complete the events, collect the letters, and claim the reward. You earn gold by playing the game. 2.) Rune is an item that you can use to increase the attack power, defense power or for special bonuses such as HP, Skill Cool Down, and more. Rune function unlocks at player level 5. At this level, the game will guide you with a tutorial that explains how to obtain rune, equip rune. 3.) As you level up, you will be able to equip more runes. Different Runes provide different types of buffs on the basis of the equipped weapon. Just above the play button, tap the drop-down menu to change the mode; solo, duo, team. If you want to play with the friends, then add them into the friend list. At the top menu on the main screen of the game, tap the friend’s icon(near mailbox icon) -> head to the add friend tab and search with the in-game name. Once done, choose the team or double mode and hit the play button. After it, tap the + icon to add the friend to the team. You can change the country flag by tapping the globe icon on the main screen at the top-left corner. By default, all the settings are OK; you don’t need to change. Your character will automatically pick the best items in the battle. If you want to disable this function, then tap the gear icon on the main screen, top menu. Go to the control settings and uncheck the box next to auto pick up option. You can customize the control or keys by tapping the key settings button in the control settings menu. After it, you will move into the preparation area. The game will show you the list of item drops and the mystery shop location. Then you will have to jump from the magical ship to the magical land. Just tap the jump button to land. After it, go inside the building, open the chests, carts, find the items on the broken sofa/shelf, and increase your power. At the bottom-left corner, tap the(i) icon to check the weapon’ stats; attack/defense/magic power, passive skill, and more. To switch to the crouch position, tap the crouch icon at the bottom-right corner. Other players will not be able to listen to you when you move in the prone state. Tap the backpack icon to check the number of items you have. To store more items in the bag, you need to increase the bag slots. Open the chests, kill demons, enemies, and you could get more bag slots. Just above the bag icon, tap the map icon to view the whole map and mystery shop details. At the top menu, you can check the safe zone area status, number of alive players, and kills. At the bottom-center, tap the (⇑) icon to check the character’s stats; attack, defense, magic, and more. If you want to leave the match, then just tap the gear icon(top-right corner) -> confirm. But you will lose ranking points. Opening the chests -> To open a chest, just go close to it and tap the search icon. To open the royale chest, you need a chest key. You can find this key in other chests; silver, wooden. Or destroy the objects, kill the demons. Renown magic chests open once every 2 minutes. Go close to the renown magic chest and tap the search icon. There you can see the collection time. Tap the start button to open. Dark Dragon Chest – Just below the mini-map(top-right side), you can check the time remaining for a dark dragon appearance. On the mini-map, there would be dragon symbols. Go there and you will find the dragon(Arrives after a certain amount of time). Defeat the dragon and get valuable items. Supply Chests – Supply chests in Survival Heroes game contains rare items or weapons. These chests appear randomly on the map. After opening the chest, the game will show you the list of items; tap on an item to pick. You will see a green arrow if the weapon is better than the current equipment set. If you want to discard or remove an item from your backpack -> then tap the bag icon -> select an item -> tap the discard button. So this is the basic Survival Heroes guide for the beginners. Now, let’s go deep into every part in our Survival Heroes guide and then check out our Survival Heroes tips, cheats & strategy guide to master the game. There are three types of weapon in the game; melee, magic and ranged. Melee weapons such as club, pan, wild axes, and more. Ranged weapons such as bow, crossbow, and more. Magic weapons such as elemental orb, thunder staff, wand and more. All these weapons have different active and passive skills. On the main screen of the game, at the bottom-left side, tap the armory option. This will take you to the weapon menu where you can check the list of weapons featured in Survival Heroes game. If you want to try a weapon, then select it and tap the training camp option. Just below the training camp option, tap the weapon’s skill icons to check the skill detail. A weapon has three active skills and one passive skill. How To Unlock Weapons In Survival Heroes Game? In the weapon menu screen, tap on a locked weapon. After it, you will see a message; how to unlock; spend gold or spend tickets. Tickets or a ticket in Survival heroes game is a premium in-game currency. You can acquire it through the top-up event(shop using real money). Another option is of gold. You can earn gold by playing the game; in the battle, you can obtain gold by killing the demons, destroying the objects, by killing enemies, and from the chests. Among all these locked weapons, there is a weapon named Curved Blades. And it can be unlocked by collecting the letters. Go back to the main screen -> on the right side menu, tap the events option -> go to the collection tab. There you will see letters; S, U, R, and more. On the right side, check out the missions you have to complete to obtain the shards. Complete these missions and get the shards. Once you have enough shards -> tap the letter to collect -> confirm. To get more shards, invite your friend. On the same screen(event -> collection tab), at the bottom-right corner, tap the rescue friend button -> copy the code -> and tell your friend to enter in the box(use other player’s invitation code). All these equipment increases the stats of a character; HP, Critical hit, attack power, defense power, magic, speed, and more. The quality of an equipment determines how much boost you will get. You can find this equipment in the chests or buy from the goblins or traders. Molotov – A bottle that explodes and burns. Trap. How To Create Room In Survival Heroes Game? On the main screen, at the bottom-right side, tap the battle option -> create room -> name it and set a password. Choose size (how many players can join) -> type; solo, duo, team. And confirm. Hit the start button and dive in. What is it? You can play with friends(if you have a lot). Or if you are a YouTuber or streamer or have a gaming group, then this function is for you. Tap the map icon and on the right side of mini-map, you will see the Mystery Shop Drop Preview. Head to the mystery shop and interact with the trader. You can buy weapons or items from him in exchange for gold. So this is a complete Survival Heroes guide for the beginners. Now, let’s dive into our top Survival Heroes tips, cheats & strategy guide. In the battle, when you reach these milestone levels; 4, 7, and 10, your weapon’s skill will level up and you will deal more damage to the enemies. Additionally, the passive skill’s buff effect will also increase. So we would recommend you to not to stop at a point on the map after getting the weapons and items. Increase the character’s skills, stats by leveling up. 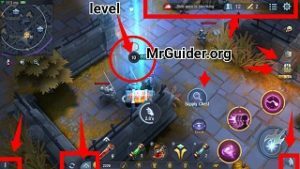 How to level up fast in the battle in Survival Heroes? It’s very easy. All you need to do is kill the demons(monsters on the map don’t attack you unless you attack. Attack the monsters and kill them to earn EXP), open the chests or destroy the objects(these actions also grant you XP), and defeat the players. A.) On the locations; Banishment Shop, Oasis Tribe, and Dungeon, open the renown chest. This chest opens once every two minutes. You can open it three times. From this chest, you can obtain a high-quality or powerful weapon or precious scrolls, traps, and more items. B.) Go to the dark dragon spawn point and wait for the arrival. Make sure you are fully equipped with armor, helmet, and weapon. Once appeared, defeat the dark dragon and get the rare or powerful weapons or precious items. Keep in mind that the dragon will also attack you. So be prepared. Don’t stay at a point when attacking. Otherwise, the dragon’s magic effect will slow down you and it will be easy for the dragon to target you. C.) Keep an eye on the mini-map and look for the supply chest spawn point. Go there and grab the supply chest. A Supply chest contains a rare weapon. D.) Another one of the best ways to get a good weapon in Survival Heroes game is to go to the mysterious shop and grab the premium deals. But you need a huge amount of gold. And make sure to check the mystery drop preview on the mini-map. Tap the scout icon on the battle screen to spot enemies. If all the teammates are using the same type of weapon(i.e. BOW), then attack power will be reduced. You can check the type of weapon your teammates are using next to their squad number(right side, mini-map). If an enemy has spotted you, then chances are he/she will chase you(if your level is low). There are two ways to overcome this situation; if the level is the same, then go for the fight. But don’t stay at a point. If you are attacking from a point, then it will be easy for the enemy to target you. Keep moving when fighting. Or if your level is low or HP is low, then it would be better to move on. Go to a safe point and heal yourself. Hide in the bushes, it may help. If you equip equipment on the basis of weapon, then it will increase your chances of winning. For each type of weapon, there is the best gear set option. Go to the armory -> tap on the equipment you use a lot in the battle -> On the right side -> under the current equipment section, you can check the whole gear set. To check the best gear set for that particular weapon, tap the search icon(expert equipment) on the bottom-right corner -> on the next screen, you will see the gears used by top players. Tap the use button to change the gear set. There are four types of rune in Survival Heroes game; attack(red color), defense(blue color), common(green color), and special(yellow, purple, and more). Go to the runes menu -> backpack -> tap the (i) icon to check the rune details. There are two options to obtain runes; spend coins or diamonds. You can obtain diamonds by claiming the activity rewards, sign-in rewards. The premium option(diamond) grants high-quality(level 4-5 or special runes). How to choose the best runes? Go to the runes menu -> recommended -> tap the weapons button and choose a weapon. After it, the game will show you the list of best runes for that weapon. You can filter it by level. Or the simple hack is; if you use a magic weapon, then equip those runes which can increase the magic effect; magic attack. If you use a melee weapon, then equip those runes which can increase the HP, ATK, DEF, and HP recovery. For ranged weapons, use runes which can increase attack speed, physical attack. You can increase the stats of a teammate with blessings. When you die, the game will ask you to choose the blessings; increase in attack, defense, HP or more.